uhhhmmmm, i didn't really know what to blog about today. i always like to have a few days or even a week of posts planned out, but sometimes that just doesn't happen. so how about if i show you what i worked on this weekend? since chris left at about 6am on saturday morning and wouldn't be back until shortly before i went to bed, i knew i had the house to myself and could really spread out (translation: make a huge mess of supplies) and listen to the grease soundtrack all day long! in addition to doing my usual boring cleaning, i knew i wanted to play around with watercolors. i kind of liked the way the one feather turned out, so i tried to make pretty much the same feather, but with different colors. i've never been very good with watercolors, but i still enjoy painting from time to time! i've also been air plant farming. i have a little collection of several air plant species that i've been watering and sunning just waiting to get babies and blooms! 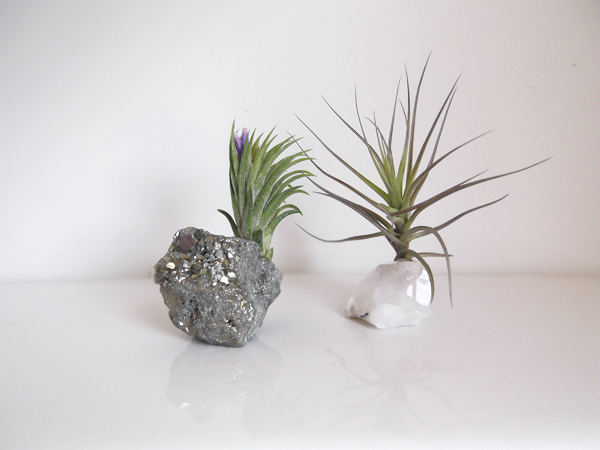 this weekend i decided to use some of the plants and stones to make these babies. i guess plants are the big home thing right now because i've been seeing them used in the most creative ways, so i figured i'd have a little fun with them as well! i guess that's all i've got for now. how has your week been so far? have you been working on any fun projects? All these posts make me want to visit your house. I really want to find a neat way to plant some succulents now that we are in the land of succulents, haha. At some point we should write some sort of post (or posts) about what we were Twitter-messaging about this morning. Also hey baby, nice plants. the only thing that's stopping you from visiting is YOU. now get to virginia! Love the paintings and the cool plants. Those are gorgeous. Starting to think about my herb garden this spring, but haven't acted on it yet. I need to find out where the best spot for it is in this new yard. i love planning for a garden because it's so exciting deciding what's going in it! Air plants are so cool. I have not seen any here in AZ but if I happen to find a vendor I am going to snag me some of those. I love house plants and before I know it my house is going to be filled with house plants. I also wanted to say that those paintings are beautiful. I have not drawn or painted anything since middle school. For some reason I just lost interest in art at that age and I did have some potential. i love plants so much. i think it's easy to lose interest in certain things, and to be honest, as much as i loved drawing with oil pastels, i lost interest for probably 10 years. maybe it'll come back to you! i need you to paint more. please and thank you. i need you to come here and tell me what to paint. please and thank you. 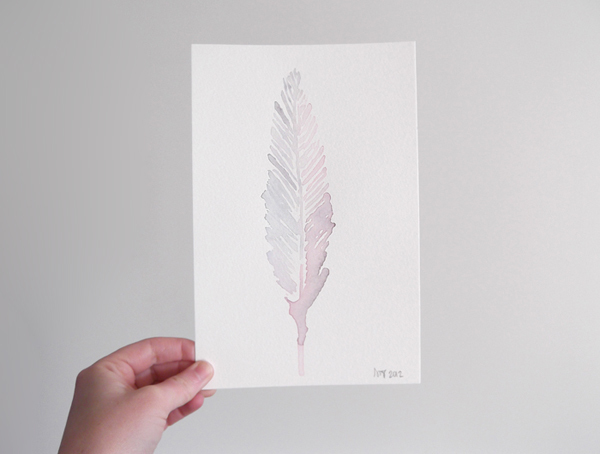 Your feather watercolours turned out great! And I love your cute little airplant babies! i did some water color too this weekend! don't you just love it? i love how the feathers turned out. Those feathers are amazing! I've always wanted to do water colours. I've been thinking about air plants a lot lately, too. They only sell them attached to god awful figurines, but I think this year, I'm just going to buy them like that and take them off. I love how you've "planted" them on rocks. I have half a geode that's just asking for a little air plant buddy. Those are such beautiful paintings! did i tell you yet how much i love these! (all of them!) my favorite things, feathers, plants and crystals... um yeah, i want one of them air plant crystal things, so awesome!!! 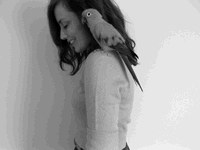 danielle, i love it! 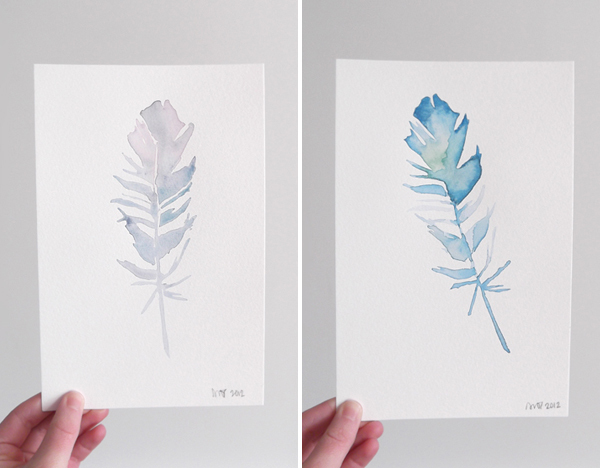 you could do a whole series of watercolor feathers. i could see them framed in white frames. and i swear, we have so much in common. i have my little rock (gem) collection too. my grandparents used to haul back rocks from new mexico all the time and over the years i have inherited some of their collection. those watercolors are really great! i love the first one especially! You are one clever little ducky! Please do a DIY post on how to get these air plants going they are divine. Oh and how quickly is your hair growing!!! !